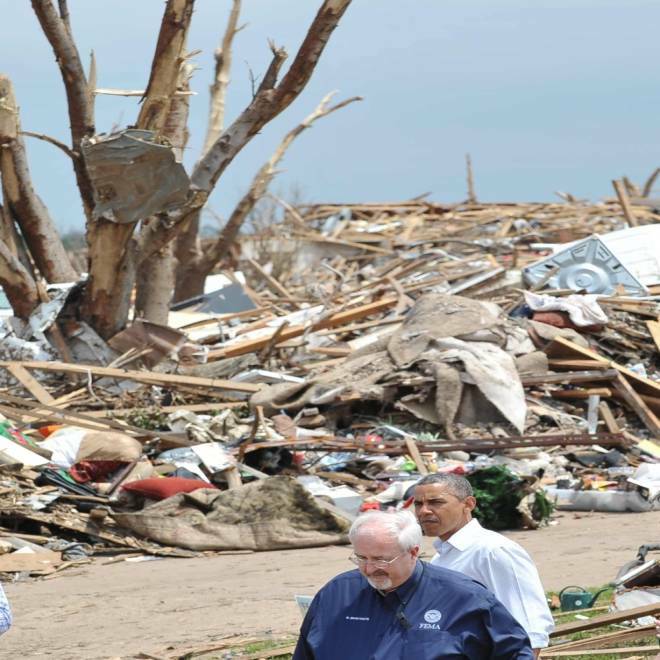 President Barack Obama walks with FEMA Director Craig Fugate, as he tours a tornado affected area on May 26, 2013 in Moore, Oklahoma. Obama is in the Oklahoma City area to survey damage from the tornado which struck a week ago and meet with victims and first responders. Disaster assistance for victims of last month’s deadly Oklahoma tornadoes has topped $25 million, the Federal Emergency Management Agency announced on Saturday. Nearly 13,000 households applied for assistance from the Oklahoma Department of Emergency Management (OEM) and FEMA after a series of devastating tornadoes in May. “There’re a lot of things we’re having to replace. You don’t think about it until after it’s gone,” Moore, Okla. Mayor Glenn Lewis told NBC News on Saturday. The first large tornado hit Moore on May 20, killing at least 24 people, injuring hundreds more, and destroying two schools. Less than two weeks later, another major tornado barreled through nearby El Reno claiming 18 more lives. The tornado that struck El Reno on May 31 is believed to be the widest tornado on record in the United States, at 2.6 miles across, according to the National Weather Service. As of last week, workers had cleared out over half of the reportedly more than 900,000 cubic yards of debris let by the storms, according to a FEMA press release. A main concern for the devastated city of Moore is rebuilding the a number of school buildings destroyed in the disaster. “The Moore school system is one of the finest in the country. A lot of people want to move here to get their children the best education they can,” said Lewis. According to Lewis it will cost at least $14 million to rebuild each school. Other priorities include replacing stop lights, rebuilding roads, and repairing electrical wires and polls. “It’s pretty hard to tell exactly what we’re going to need,” Lewis said. Oklahoma Governor Mary Fallin declared a state of emergency in 41 counties as the storm-battered region reeled last month. Search and recovery efforts continued for victims who went missing after being swept away by Oklahoma River flood waters, NBC News affiliate KFOR reported. In the violent storms that swept across the state between May 18 and June 2, over 50 people including at least 20 children and three veteran storm chasers were killed. The most common cause of death was drowning. Immediately after the storms, President Barack Obama declared a major disaster, making federal aid available to people in five counties. Lewis said his town still has a long road back to normal.